Bladder stones are common problems for many pets including cats, guinea pigs, and dogs. These stones can cause bladder issues such as pain, inflammation, and trouble urinating, so while they may be common problems, they are also serious issues. Preventative measures can be taken for dogs prone to developing stones and various treatment options exist for dogs diagnosed with bladder stones, depending on the type of stone that has formed. By learning more about bladder stones, dog owners may be able to help prevent them from forming, know how to recognize the signs and symptoms in their dog if they do, and understand the treatment options that are available to them. 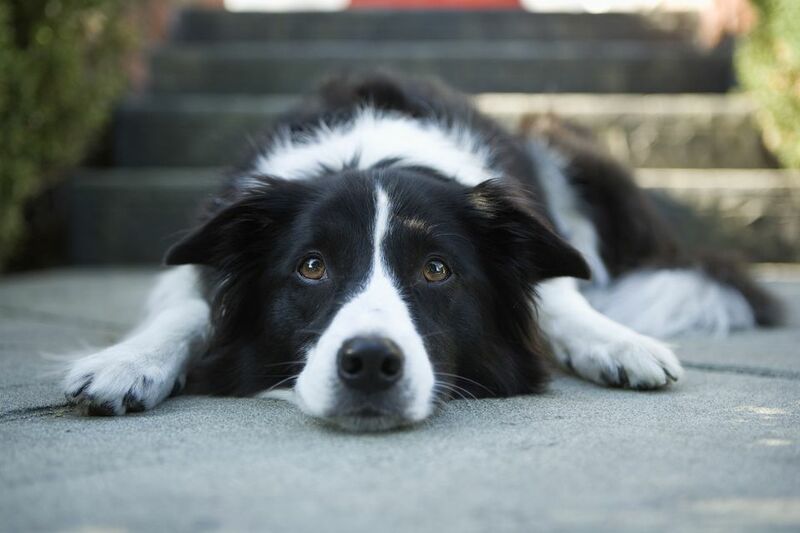 What Are Bladder Stones in Dogs? Bladder stones, or uroliths as they are technically referred to, are hard, stone-like items that form within the bladder of a dog. These stones can be made up of bacteria, crystals, and various minerals from within the bladder and form various shapes. There can be one or many bladder stones within a dog's bladder and they can grow to be very large or stay very tiny. They are different from kidney stones since they form inside the bladder and not the kidney of a dog. There are several different types of bladder stones that dogs get. Struvite stones: Struvites are also referred to as triple phosphate stones and are usually smooth, pyramidal, and white bladder stones. Dissolved struvite is a normal part of a dog's urine but when changes in the urine occur and it combines with bacteria, it can lead to the creation of stones. Because struvite is a normal component of the urine, these stones are the most commonly seen type in dogs. Calcium oxalate stones: Almost as common as struvites, calcium oxalates are bladder stones that affect a large number of dogs. These stones can vary in color from white to dark and are heavily textured. Urate stones: Urate stones are not very common but are seen in certain populations of dogs. Cystine stones: One of the more rare types of bladder stones, cystine stones are usually only seen in male dogs. This stone is textured and can vary in color. Silica stones: Resembling a jack, silica stones are another rare type of bladder stone in dogs. When a dog has a urinary issue, they will exhibit signs and symptoms of discomfort and trouble urinating. Licking at the urinary tract opening is an indication that something might be uncomfortable or painful in that region and straining or crying while urinating may also be seen in dogs with bladder stones. Frequent urination or urinating in the house may also be attempted by dogs with bladder stones because of the pain or discomfort they are feeling. Even if their bladders aren't full, dogs may feel like they need to urinate. One of the most obvious signs that a dog has bladder stones is blood in the urine. When bladder stones irritate the bladder wall, blood is released into the urine. Sometimes blood clots are observed but other times the urine is pink or red due to the presence of the red blood cells. If there is snow on the ground where your dog urinates, it will make this symptom all the more obvious. Depending on the type of bladder stone a dog has, the causes may vary. Struvite stones: Because dissolved struvite is normally present in the urine of dogs, if the pH of the urine changes due to the presence of bacteria and the urine becomes too concentrated, this struvite might precipitate and form crystals. These crystals can then combine with minerals in the urine and the bacteria from a urinary tract infection to form stones. Calcium oxalate stones: The pH and minerals in urine cause calcium oxalate crystals to form which then turn into stones. There may be other causes as well but the formation of these stones is not well understood. Urate stones: These stones are thought to be linked to a genetic abnormality that affects the normal metabolism of uric acid in dogs. Cystine stones: These stones are purely thought to be linked to genetics. Silica stones: Various dietary factors are thought to cause silica stones to form but since they are so rare, not much is known about how they are caused. X-rays are the most commonly utilized diagnostic tool that veterinarians use to confirm a dog has bladder stones. Since bladder stones are solid items, they will reflect the X-rays and show up as white objects inside your dog's bladder. A small percentage of bladder stones, such as urate stones, do not reflect X-rays though and will only show up on an ultrasound. Your veterinarian may also make an educated guess as to what type of stone your dog has based on the presence of crystals in the urine. These crystals may be seen in a sample of the urine when it is looked at under a microscope during a urinalysis. Some dogs are more likely to develop bladder stones than others. Dalmatians, English bulldogs, and black Russian terriers are more likely to develop urate stones than other dogs. Female dogs of all breeds are more likely than males to develop struvite stones, but males are more likely than females to develop calcium oxalate stones. Dogs with urinary tract infections are more likely to develop struvite or calcium oxalate stones than dogs without urinary tract infections. Shih tzus, yorkies, bichon frises, lhasa apsos, and miniature schnauzers are at risk for developing struvite or calcium oxalate stones, and German shepherds are more likely to develop silica stones than other dogs. Dogs who have family members that have developed cystine stones are more likely than others to develop them themselves, and dogs that have certain liver diseases are more likely to develop urate stones. Dietary changes to dissolve the stones may be recommended by your veterinarian depending on what type of stone is present in your dog's bladder. Struvite stones, if not problematic, are the most common type of stone that may be able to be dissolved by feeding a special diet. Surgery to remove the stones is the most commonly used treatment of bladder stones. Most stones aren't detected until they are causing a problem for your dog so waiting weeks or months to see if a diet will dissolve the stones could cause more problems for your dog, such as the life threatening inability to urinate. Ultrasonic dissolution is a less commonly used method of treatment for bladder stones. It is available in specialty veterinary hospitals and breaks stones up inside the bladder using ultrasonic waves. Once broken up into small enough pieces, the stones can then be flushed out through the urinary tract opening. Flushing very small stones out with saline may also be done. Some stones are small enough to pass through the urinary tract opening without having to break them up with ultrasonic dissolution so your veterinarian may flush them out of the bladder using a catheter and saline in a syringe. If you have a dog breed that is more likely to develop bladder stones, your veterinarian may recommend feeding a special diet that is designed to decrease stone development. They may also recommend increasing fluid intake to encourage regular urination and decrease urine concentration as well as keeping the urinary tract opening clean to help prevent bacterial from entering the bladder. Finally, if a dog has a history of a stone that has been linked to a genetic abnormality, that dog should not be used for breeding purposes.